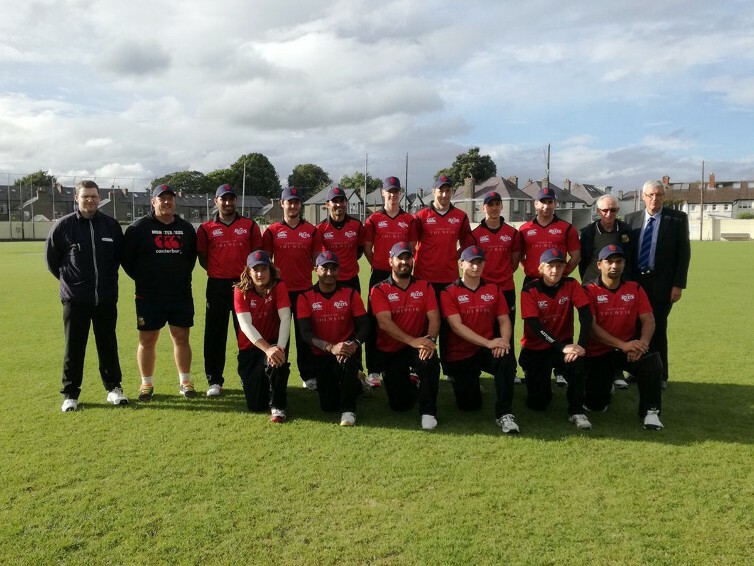 The Munster Reds took on a Northern Knights XI in a two match T20 Challenge Series at Terenure on Friday, 19th August, and came away with two impressive victories over the northern side. The match forms part of Munster's preparations for possible admission to the Irish Interprovincial Championships in 2017. Batting first in Game 1 the Knights were in difficulty from the off losing the wickets of Michael Gilmour and Adam Berry, Allan Eastwood and David Murphy each picking up a wicket in their opening overs. Eastwood went on to claim 3-27 in his 4 over spell while Murphy finished his allocation with 2-19 and Mudassar Aziz an economical 3-15. Jamie Holmes was the only Knight’s batsman to make a mark with 52 and the Knight’s total of 117 was never likely to be defendable with the short straight boundaries. So it proved with Stephan Grobler scoring a quick fire 53 ( 3x4, 4x6) and opening partner Arslan Anwar 30 (4x4, 1x6), putting on 64 for the first wicket. A further 32 for the second meant that the Reds were able to cruise home by seven wickets with almost a quarter of their overs unused. Munster Reds 118-3 [15.2] (Grobler 53 (31), Anwar 30) beat Northern Knights XI 117-9  (Holmes 52, Eastwood 3-27, Aziz 3-15, Murphy 2wkts, Bauer 1wkt) by 7 wickets. Game 2 proved no easier for the Knights as the Reds ran up a formidable 204/5 in their twenty overs. Conor Mullan (69) and Cormac Hassett (38) led the way before a final push by Mubeen Ali whose 26 not out contained 3 fours and two sixes. In the Knight’s reply only Alex Haggan (32) and Steve Lazars (26) provided some middle order resistance but Aaron Cawley’s 3-32 and 2 wickets each for Bauer and Saddique meant that the Knights were never in the hunt as the Reds ran out 105 run winners. Munster Reds 204-5 (Mullen 69, Hassett 38, Ali 26*, Bauer 22, Bryans 2-27) beat Northern Knights XI 99 all out (Cawley 3-32, Bauer 2-11, Saddique 2-18) by 105 runs.